There's a misconception about distributed companies: that in order to work for one you have to work remotely, or alone. While there may be thousands of miles between you and your colleagues, it is our belief that these companies can be as close-knit, effective, and serendipitous as those under one roof. Currently, we all work for (or have worked for) companies that are purposely spread out, and we are always finding new ways to meaningfully connect our team. For this panel, subjects will flow from the pragmatic: "how do you brainstorm without a whiteboard?" to the harder ones: "how do you celebrate successes when you're miles apart?" Bring your questions and yourself, because we can't skype you in for this one. 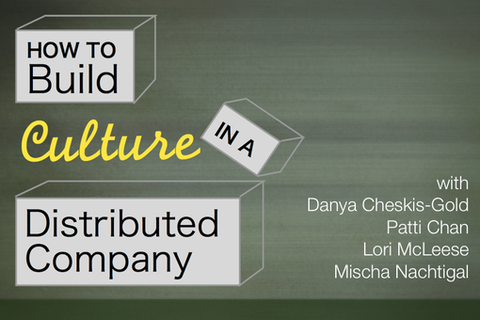 Danya Cheskis-Gold builds communities, teams, and businesses. She's been a national recruiter at Teach For America, a founding employee at Skillshare, a consultant for early stage startups, and is now the Director of Community at Spark Capital. She also runs Pop-Up Shabbat, blogs about getting what you want, teaches classes, and is writing a book for early stage startup employees. Lori loves to laugh, travel, and write. She’s been fortunate to visit 51 countries and looks forward to exploring more. She loves hearing people’s stories and having the opportunity to live a day or two in their reality. Professionally, she helps make great companies even better through human resources and operations work. She’s currently working with the wonderful folks at Automattic (best known for WordPress.com). Previously, she was at Room to Read, Mervyn’s, CMP Media, and Oracle. Mischa is works at Upworthy in a variety of roles. Before that he worked at Twitter on the media team, and before that he was a consultant for the TED Conferences. When he's not in front of a computer, Mischa is a co-founder and the director of programming for San Francisco's Food & Farm Film Festival, which pairs food with films every Spring. If you have a great story, he wants to hear it. Patti Chan has been crafting online experiences since 2002. She uses her developer, UX, and agile project management background to guide talented teams in building intelligent solutions for enterprises to startups. She's the Managing Director of Project Management at Intridea, a global force distributed across three continents. Patti has spoken at top universities and corporations, SXSW and Distill. She's also hosted Ignites on both coasts. She rounds out her geek cred with a BA in Psychology, and Entrepreneurship & Management from the Johns Hopkins University.